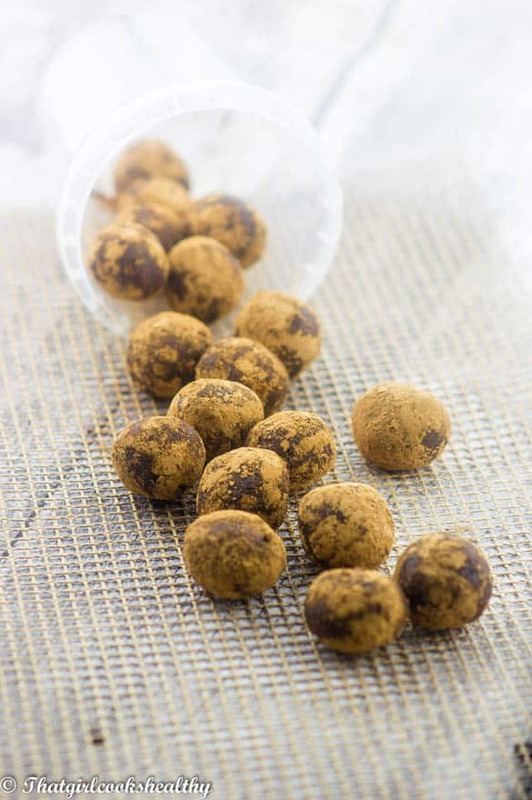 Raw chocolate energy balls – delicious raw vegan chocolate energy balls made from cacao, nuts, dates, raisins, vanilla and nutmeg. 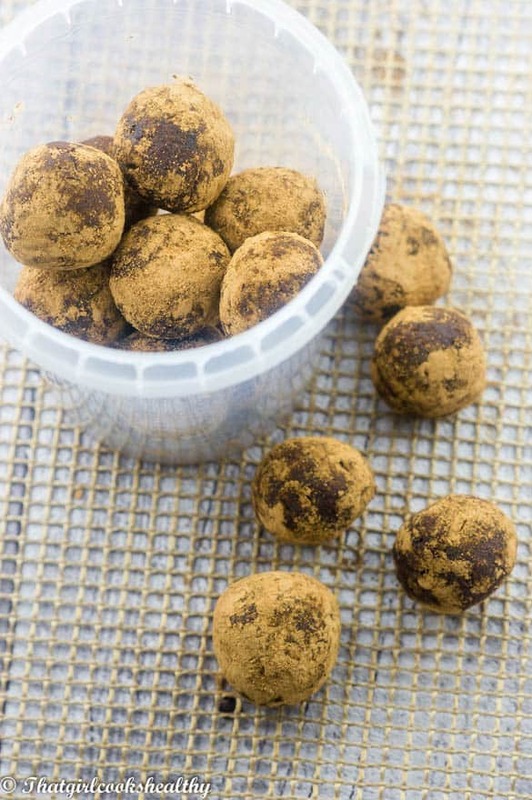 If you’re a huge fan of anything with chocolate in then you’re going to go crazy for these double chocolate energy balls. 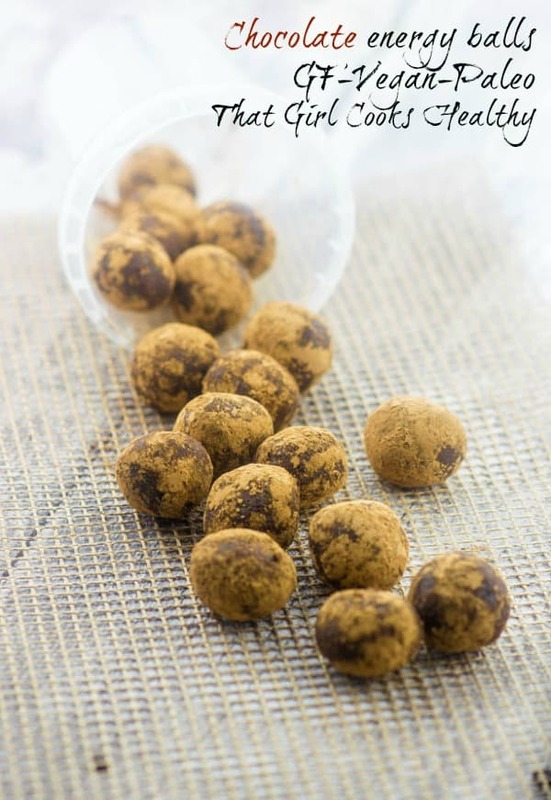 I really enjoy making my own energy balls because I have complete control over what ingredients are included and there’s the ability to explore your creative side. It’s a fun filled tool to get your children involved in shaping the balls for a healthy cause or even bring out the inner child in yourself. 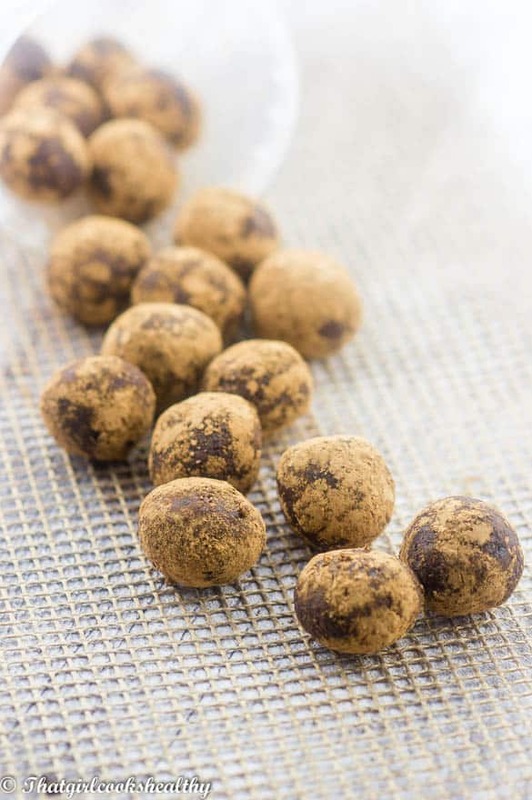 These raw chocolate balls are imbued with fibrous, natural sweetness from the dates and the correct amount of carbohydrates to sustain stamina for exercise. Whether you’re eating these as a pre-workout snack or simply consuming as means to replenish the body after an intense workout, you will acquire the raw, authentic nutrition that your body needs. Even if you don’t workout, that’s fine, simply nibble away at your leisure. I used raw cacao which is the most pure form of chocolate, it is less refined than cocoa powder and is thought to be the highest form of antioxidants in all foods with the highest amount of magnesium. 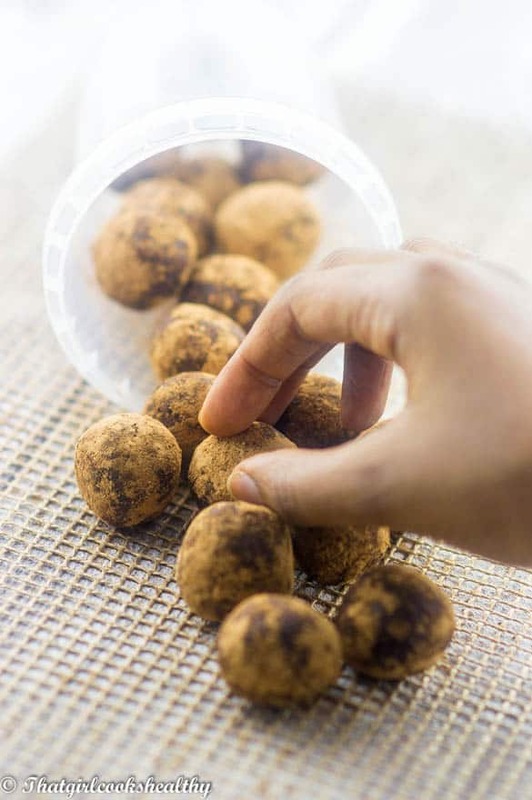 Cacao nibbles are essentially the beans cut into small pieces which the cocoa pods produce. The components of the cocoa pod provide cholesterol free saturated fats with an abundance of fibre, vitamins and minerals. Chocolate is a great comfort food, our body secretes a chemical reaction called “endorphins” which creates a utopia, giving that happy feeling. There’s no need to feel guilty when eating chocolate in its rawest form, it’s loaded with many health properties. 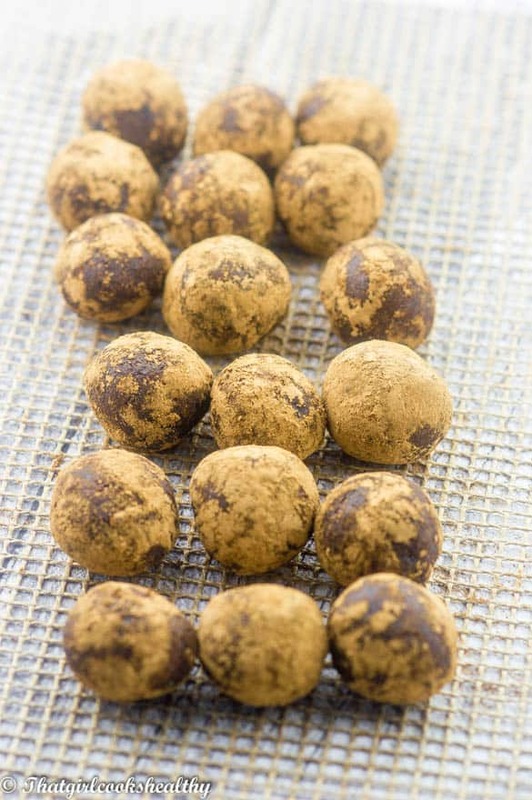 What equipment do I need to make these chocolate energy balls? As always I make my energy treats using my food processor. The dates are pre-soaked – softening them quickens the breakdown process in the food processor. How should I store the energy balls? Once finished store them in my refrigerator, however feel free to store them in the freezer. How long do they last? you may ask! Well I have no idea as they’re usually eaten within hours. At a guess I would say 3-4 days. Blitz the almonds and walnuts on high speed for 45 seconds, using a S blade. You want the consistency to be semi fine, not chunks or completely ground – somewhere in between. Add the cacao powder, salt, nutmeg, raisins, vanilla and pitted dates to the nut mix. Pulse all of the ingredients for 30 seconds and then finally include the cacao nibbles. Process for approximately 1 minute or until a huge ball is formed. 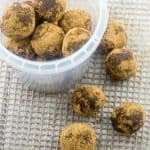 Roll the dough into miniature balls and dust in excess cacao powder.